Read on to find out how Cardiac researcher Elisabeth Ehler uses Jackson ImmunoResearch cross-adsorbed (min X) secondary antibodies to multiple label with primary antibodies derived from closely related host species – enabling her to differentiate cell types in primary cardiac cell cultures. Dr. Ehler has been a non-clinical senior lecturer in the department of medicine at King’s College London since 2003. Her research explores the organization of heart cells (cardiomyocytes) at a subcellular level; mainly from a cytoskeletal and signaling point of view. This allows her to elucidate the assembly of the heart’s cytoarchitecture during development, and how adaptations to increased workload, or during cardiac disease, are made. How are myofibrils and intercalated discs assembled in heart cells during development? How (and if) are myofibrils and intercalated discs affected in the diseased heart? What is the functional basis for the adaptations of cardiomyocytes during development? Figure 1: Determining Cardiomyocytes from heart primary cultures: 3 cell types are identified in this image. Red only cells show fibroblasts (positive for Rat Anti-tubulin); Smooth muscle cells are positive for both tubulin (red) and desmin (blue). Cardiomyocytes are identified in this image by their exhibition of green stripes, positive for sarcomeric alpha-actinin. Determining different cell types in primary cultures. Different cell types can be distinguished using antibodies probing for protein markers specific to the cell type. Multiple markers can be detected using secondary antibodies targeted against the different host species of each primary antibody. Different colored fluorescent probes conjugated to the secondary antibodies allow each marker, and thus each cell type to be identified. Learn more about multiple labeling here. Primary antibodies are often only available in a limited range of species, and it may not be possible to avoid using closely related species such as mouse and rat. It is therefore essential that your secondary antibodies are cross-adsorbed to prevent misidentification of markers. Figure 1 shows the variety of cells that may be present in primary cell cultures, “not all of them are cardiomyocytes, that’s the key to show how specific your secondary antibodies are!! !” says Dr. Ehler. Jackson ImmunoResearch cross-adsorbed secondary antibodies allow the closely related primary antibody host species to be distinguished, enabling different cell type markers to be detected – and ultimately the cell types discerned. 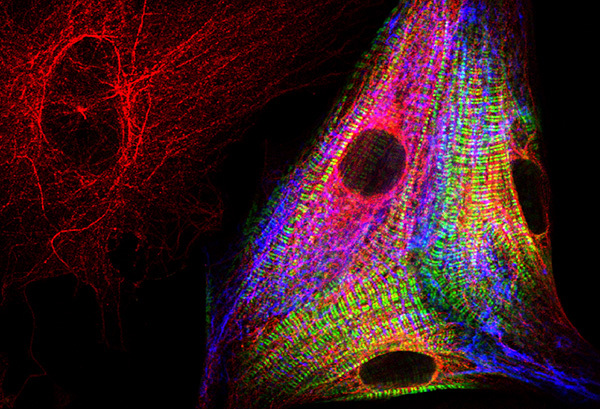 Primary cardiac cell cultures were probed for fibroblasts using Rat Anti-tubulin (Red), and smooth muscle cells using Mouse Anti-desmin (blue), both of these cells do not stain when probed using Rabbit Anti-sarcomeric alpha-actinin (the stripy green signal), which is cardiomyocyte specific. 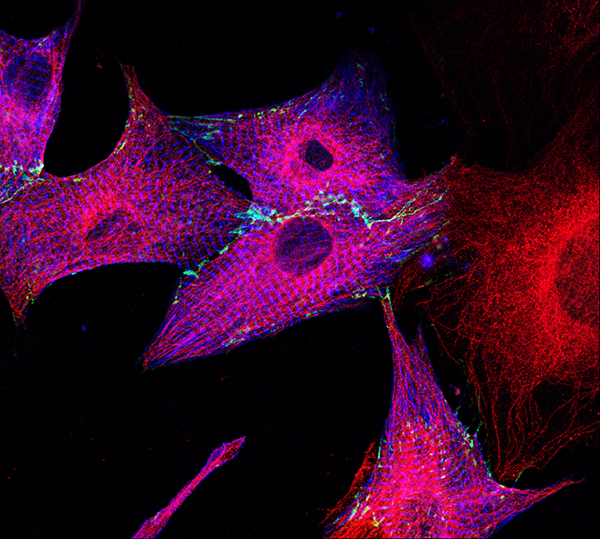 Figure 2: Cells positive for tubulin (red) are fibroblasts. Staining for sarcomeric alpha-actinin (green) is cardiomyocyte specific. Exquisite specificity – Distinguish rat from mouse. Dr. Ehler’s work clearly shows the exquisite specificity of Jackson ImmunoResearch cross-adsorbed (min X) secondary antibodies in their ability to differentiate between mouse and rat primary antibodies. 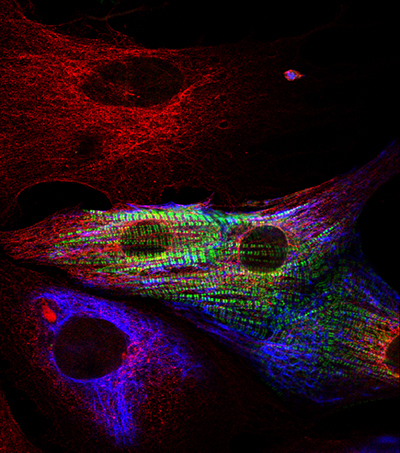 In Figure 3 the cells are probed using Myosin Binding Protein-C (MyBP-cardiac) to identify cardiomyocytes (green). The figure shows a red and blue cell, positive for both tubulin (red) and desmin (blue), but the absence of green stripes indicate it is a smooth muscle cell. The red-only neighbor to the left is a humble fibroblast – positive for rat-anti tubulin. This differentiation between cell types can only be achieved if the secondary antibody is able to distinguish between closely related species. Figure 3: Fibroblasts positive for tubulin (Red), Cells also positive for Desmin (blue) with an absence of green (anti-MyBP-C) stripes indicate they are smooth muscle cells. Learn more about multiple labeling with JIR secondary antibodies here!